The studio is attempting to build a campaign with as little story as possible. 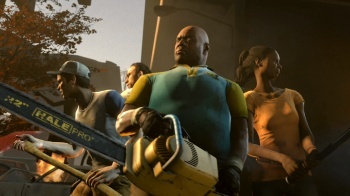 Valve has decided to do something a little different for a next batch of Left 4 Dead 2 DLC. Rather than meticulously planning the whole thing itself, Valve is turning the process over to the L4D community, and letting it have a say in how the new campaign goes together. On the L4D blog, Valve said that community modder Matthew Lourdelet had show the studio the start of new campaign he was working on, "Cold Stream." Valve said that it had been tempted to help him finish it and get it out to people as soon as possible, but had resisted the urge because it wanted to try an experiment. Valve said that the previous campaigns that it had released for L4D2 had all been very story-orientated, so with "Cold Stream" it wanted to take the completely the opposite tack and focus entirely on gameplay, with no new story or audio included in the campaign. It also wanted to hear from L4D fans about what they'd like to see in the campaign. To that end, Valve has set up a special forum for "Cold Stream," where people can leave their suggestions. So far people have put forward ideas like boss battles, rooms filled with explosive barrels, and "gauntlet" levels where the only way to survive is to keep running. Valve has not decided exactly when the new DLC - which will also include the rest of the campaigns from the first Left 4 Dead - will be released, but it will be after Portal 2 comes out in April, so it won't be for a few months at least. There will be a beta version for players on the Mac or PC however, so players on those platforms will be able to give it a try slightly earlier.